Our firm is committed to making changes to create an easy and more efficient attorney-client relationship. New clients* now have access to safe and secure online portal! What is the online client portal? 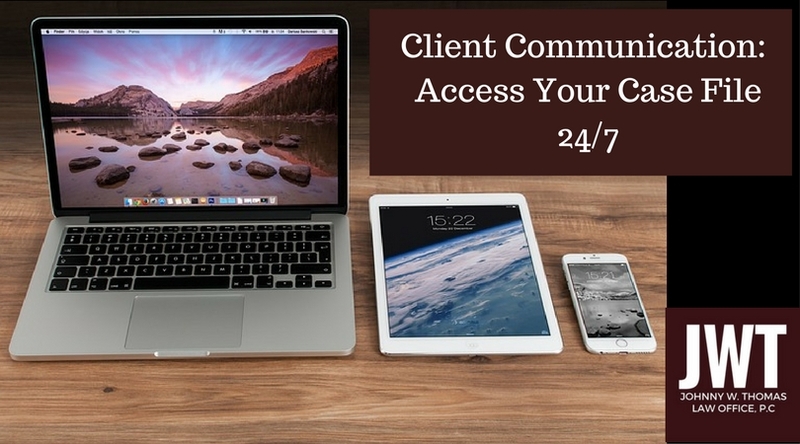 The online client portal is a safe and secure system that allows you to have 24/7 access to your case information. The portal also provides a secure method to send messages and documents to your attorney. In order to have access to an online case portal, please provide our firm with a personal email address. We will send you an email to create a secure log–in password for your portal. Need to review important case documents? No need to make the journey to our downtown office to review documents. Instantly view documents uploaded by your attorney. Have a document you would like your attorney to review or add to your file? Just scan and upload the document to the client portal. You can also attach comments to your document if you have specific questions. Have a quick question for your attorney, but no time to call the office? You can send an instant message through the portal to your attorney and receive a reply quickly. Need a reminder for your next appointment? The client portal has a built-in calendaring system. You can view upcoming appointments and hearings. The system even allows you to set email reminders for important dates. Want to review your current invoice? Your current invoice is available in your client portal for your review. You can make a payment online with a credit/debit card or an electronic check. Trust account information is available as well. Do I have to use the client online portal as a client of the firm? No. Our firm still offers the traditional approach to attorney-client communication for those who prefer it. However, the security and the efficiency of the online client portal is definitely worth a try! To learn more about our online client portal, click here! If you are current client, access your case by clicking here! *New clients – General Practice legal matters only.